The Rapid Test Complete detects key chemical markers in human urine. This package comes with 100 strips or 100 tests that you can use. The one strip also tests for 10 different tests in one use. 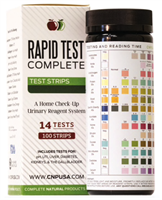 he Rapid Test Complete detects key chemical markers in human urine. This package comes with 100 strips or 100 tests that you can use. The one strip also tests for 10 different tests in one use. • Leukocytes - For urinary tract infection and the presence of bacteria. • Nitrites - A UTI Test which is usually an indicator of Urinary Tract Infections. • Urobilinogen - Liver function test and Liver Disease Indicator. • pH Test - A determinate of the acidic or alkaline state of the urine. • Protein - An indicator of possible kidney health issues. • Blood in Urine - Usually a test for kidney stones that is most often an indicator of Kidney Stones and if stones form or are forming. • Ascorbate - The Amount of Vitamin C in your Urine. • Specific Gravity - a reflection of how well the kidneys are filtering, or the GFR (Glomerular Filtration Rate). • Ketones - An indicator of diabetes and other acetoacetic changes in the urine. • Bilirubin - A test and indicator of Liver or Gallbladder issues. • Glucose Test - A measurement of the sugar in the urine usually caused by diabetes. • Microalbumin - Can help test for Kidney damage and kidney health. • Creatinine - Kidney Health to make sure it is getting rid of the creatinine in your body. • Calcium - Check for calcium levels, which can be a part of the Heart, Kidneys, and Thyroid. This Urinalysis Reagent Test is an easy to use test for the detection of key chemical markers in human urine. They are the same test strips used routinely by doctors, laboratories, and health care professionals in preliminary diagnosis of, and initial screening for potential health problems.